You know there’s a need for math teachers. You enjoy math. You’d like to teach students to enjoy it! One thing stands between you and those eager math students: you must pass the Praxis Mathematics Content Knowledge test. If you can do math, you can pass the Praxis, right? Maybe. . .but there’s no guarantee! Time Lapse Since Math Classes: it’s been awhile since the last math class! Amount of Content: it’s SO MUCH to know and remember! Preparation: not knowing how or what to study! These comments are not rare! Just because you’re good at math and have passed your math courses does NOT mean you will pass the Praxis Math Content Knowledge test. There are steps you can take to avoid wasting time and money on retakes! 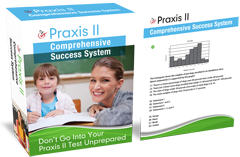 Part of your strategy will be using a helpful Praxis study guide to earn a passing score. If you follow these easy steps and START NOW, you can be fully prepared to pass the Praxis Mathematics Content Knowledge Exam the FIRST time! START NOW! Do not wait until the week of your Praxis Mathematics test to begin! Give yourself time to study. Start by knowing what’s on the Mathematics Content Knowledge test. Then, go to step 2: Learn What You Don’t Know! Learn What You Don’t Know! You’re probably thinking, “Duh!” Right? Of COURSE I have to learn what I don’t know! But many teacher candidates don’t take the time—or don’t leave ENOUGH time to look closely at what they DON’T KNOW on the Praxis Math Content Knowledge test. How long ago did you take a test? Was the test on ALL THE CONTENT YOU EVER LEARNED IN MATH? How can you AVOID failing the Praxis Math? READ CAREFULLY through the content this test expects you to Understand, Explain, Use and Graph! Now that you have learned what you don’t know, you can find help to learn or review the content on the Praxis Exam. Because the Praxis Mathematics Content Knowledge Test is HIGH STAKES, many individuals and companies have study guides and practice tests to help you. How can you choose the BEST one for YOU? Follow these simple rules to find the BEST Praxis Math study guide. Look at the book’s. . .
Do you learn why each answer is correct AND why answers are incorrect? Does the Praxis Math study guide explain test phrases and key words used in questions and answers? TEST-TAKING: is there a section on test-taking that gives more than just a list of tips? Does the information seem like something YOU can do? Take the time to find the best Praxis Math study guides and you have only 2 steps to go toward passing the Mathematics Content Knowledge exam the first time! Once you purchase Praxis Math practice tests and prep books, you still have to study wisely. The Praxis Math test is timed. An onscreen graphing calculator is available to help you answer some of the 60 questions in the 150 minutes allowed. You may request access NOW to this calculator on the ETS website. You may not need the calculator for many questions, but it’s a TIMED TEST! Don’t waste time learning to use the onscreen calculator DURING the test! Be familiar with it NOW! Now that you have your Praxis Math practice materials, use current research to help you set up a schedule for success! Mark the questions that take more time than others. Is there a pattern in these questions? Is it the wording of the question that is confusing? Or is this material that is less familiar to you? Use the test-prep ideas in your Praxis Math study guide to help you further. Test-taking is a skill! You may know the Praxis Mathematics Content Knowledge study guide material, but if you do not know how to take a test on that information, you may not pass the exam. Now is not the time to stop studying for the Mathematics Content Knowledge exam. It’s also NOT the time to CRAM for HOURS AT A TIME! Instead, focus on your weakest areas. Follow these steps and they’ll lead you to success! Don’t waste your time and money on retaking the Praxis Math. Instead, choose to invest in the best Praxis Math practice tests and study guides that will help YOU pass the test the first time!